What Day Of The Week Was May 10, 1997? 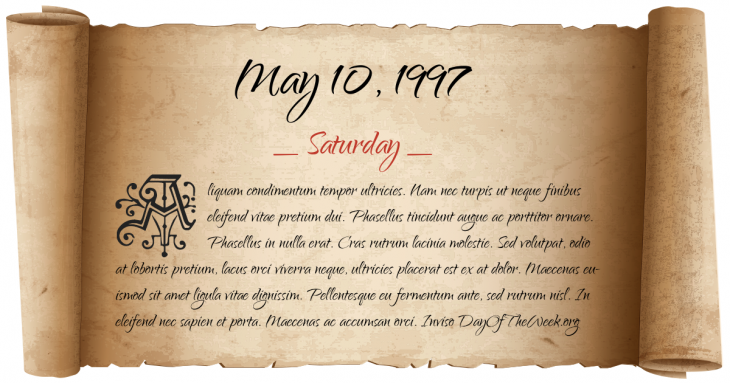 May 10, 1997 was the 130th day of the year 1997 in the Gregorian calendar. There were 235 days remaining until the end of the year. The day of the week was Saturday. A person born on this day will be 21 years old today. If that same person saved a Quarter every day starting at age 4, then by now that person has accumulated $1,638.75 today. Here’s the May 1997 calendar. You can also browse the full year monthly 1997 calendar. A 7.3 Mw earthquake strikes Iran’s Khorasan Province, killing 1,567, injuring over 2,300, leaving 50,000 homeless, and damaging or destroying over 15,000 homes. The Maeslantkering, a storm surge barrier in the Netherlands that is one of the world’s largest moving structures, is opened by Queen Beatrix.